Warden is a small village on the north-eastern coast of the Isle of Sheppey in Kent. 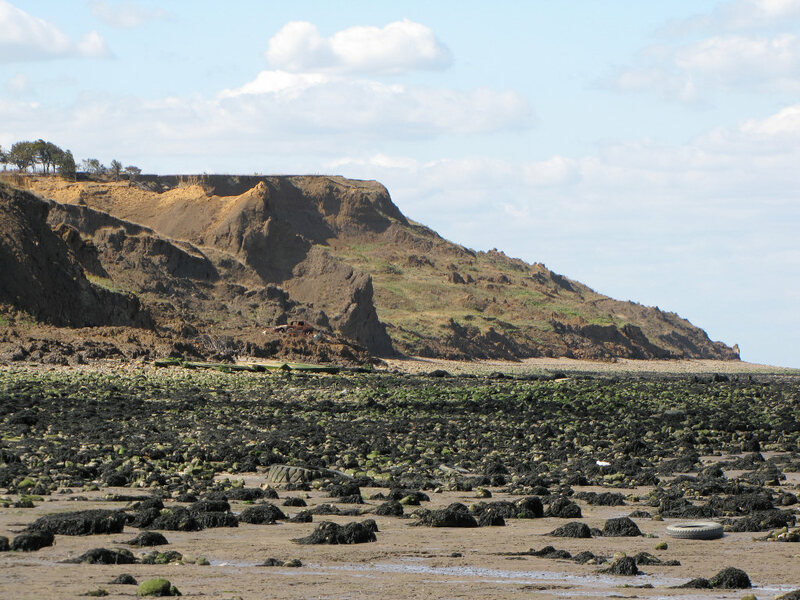 Immediately northwest of the village and continuing towards the west is Warden Point, a pinnacle of eroding land and muddy foreshore. 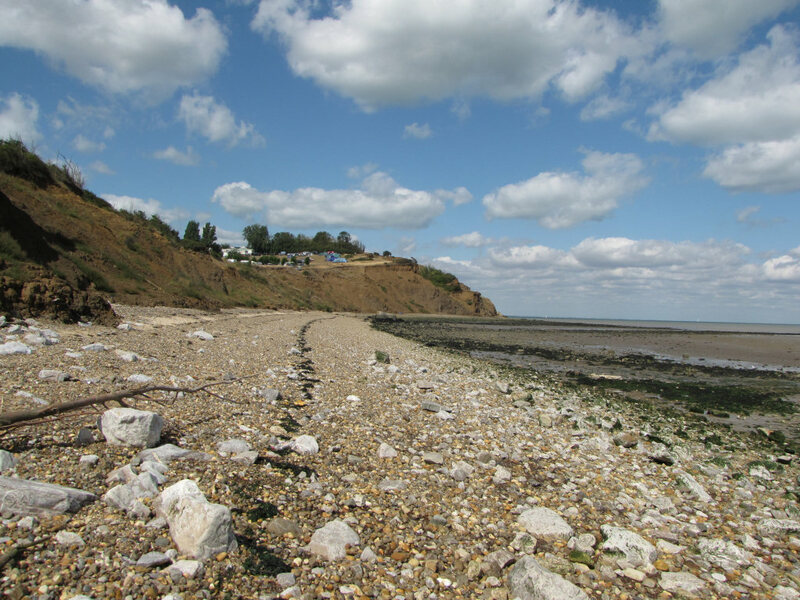 The following page is based on the 2 mile stretch of coastline, encompassing Warden Point, between Warden Bay and Eastchurch Gap (Hen’s Brook). Above: The eroding coastline has disappeared from beneath these military buildings at Warden Point, leaving them isolated on the beach. 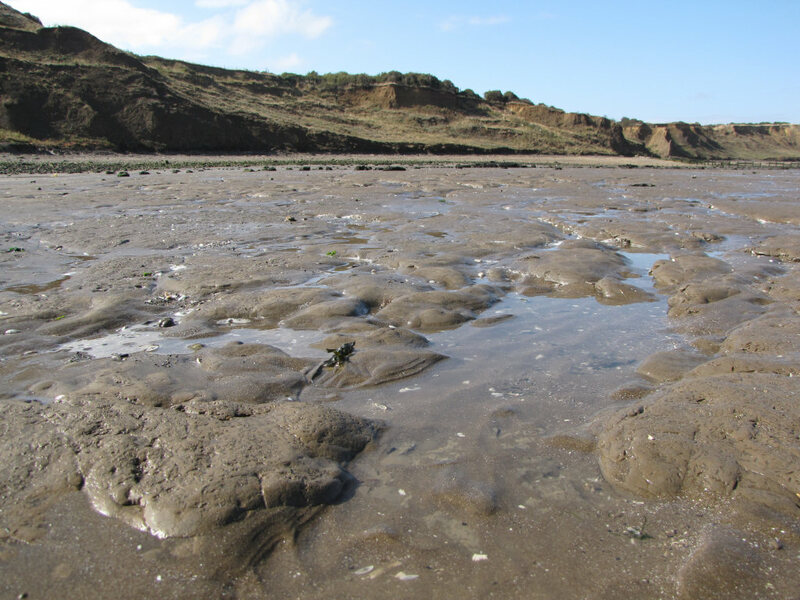 Above: The eroded sediment from the surrounding area accumulates as deep mud on the foreshore. Care should be taken to avoid the deepest areas. Although Warden Point is unlikely to score well in a beauty contest, the cliché ‘beauty is on the inside’ is very fitting, as beyond the surface aesthetics lies a dynamic and exciting prehistoric history. 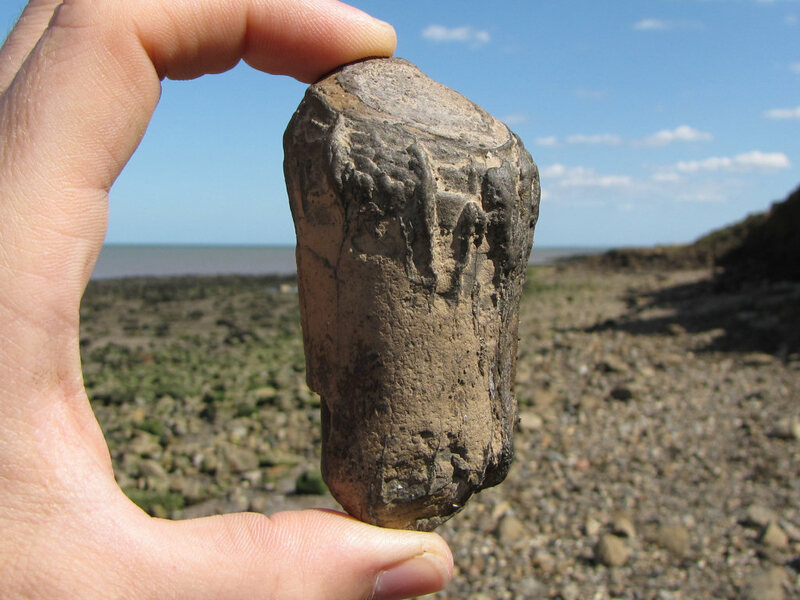 For centuries the eroding coastline around Warden Point has provided one of the most productive areas for the study and collection of fossils from the London Clay. 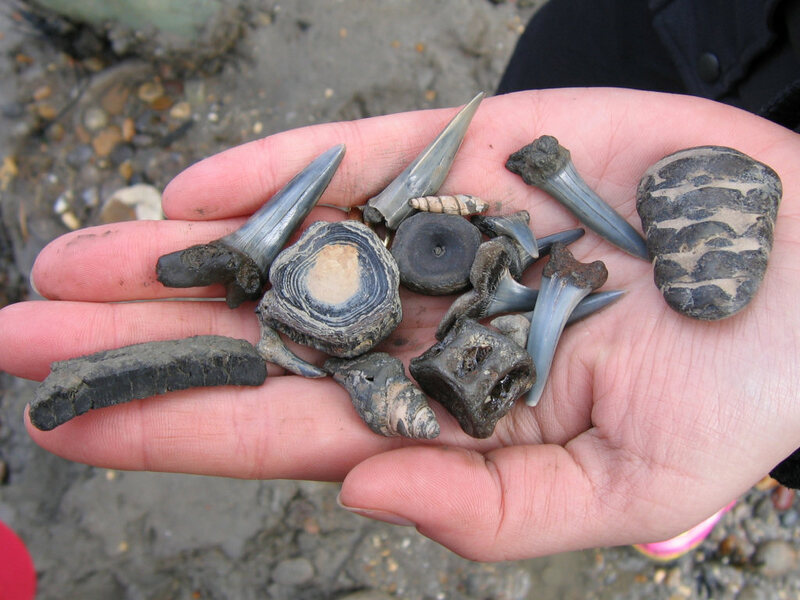 Among the finds include largely complete crustaceans, nautili, shark teeth and vertebrae, snake skeletons, bird skulls and a variety of land sourced fruits and seeds, and much more. Above: The carapace and left claw of a Zanthopsis crab protruding from a phosphatic nodule. Right: A Nipa palm fruit, composed of iron pyrite. Access to Warden Point can be made on foot from Imperial Drive, at the end of which a small gravelled car park provides free parking all year round. 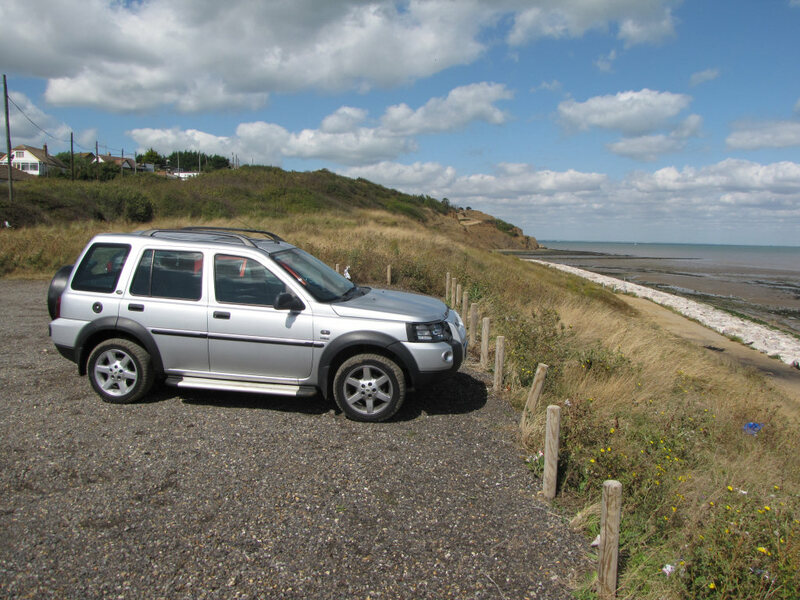 Alternatively access can be made across the slumping cliffs at Eastchurch Gap. Above: Parking is available in a car park alongside Imperial Drive. Above: From the car park it’s a short walk to the beach and onwards toward Warden Point. Figure 1: View from Eastchurch Gap, overlooking the cliffs and beach. 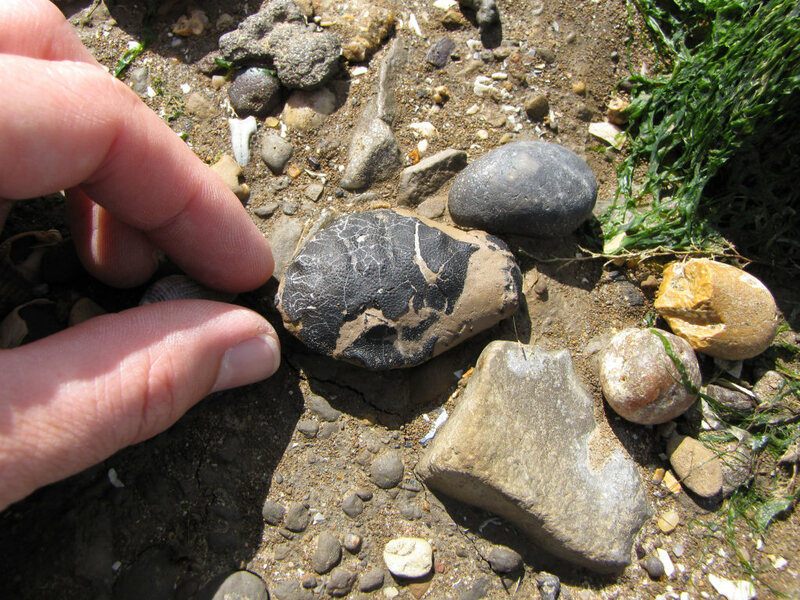 The London Clay appears in situ on the foreshore and in the cliffs. 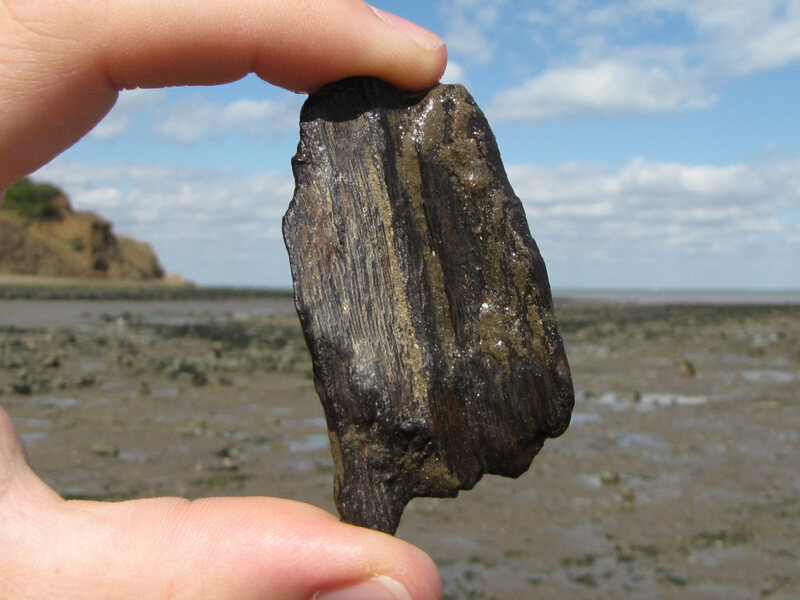 The London Clay exposed between Warden and Eastchurch Gap (and onwards towards Minster) encompasses around a million years of sedimentation, dating from the early Eocene epoch of the Palaeogene period, 52-51 million years ago (see geologic timescale). At this time southern England was located approximately 40°N of the equator, 10°S of its present latitude, comparable to Spain today. The average annual temperature across southern England at this time was approximately 23°C, compared with the present-day figure of around 10°C. 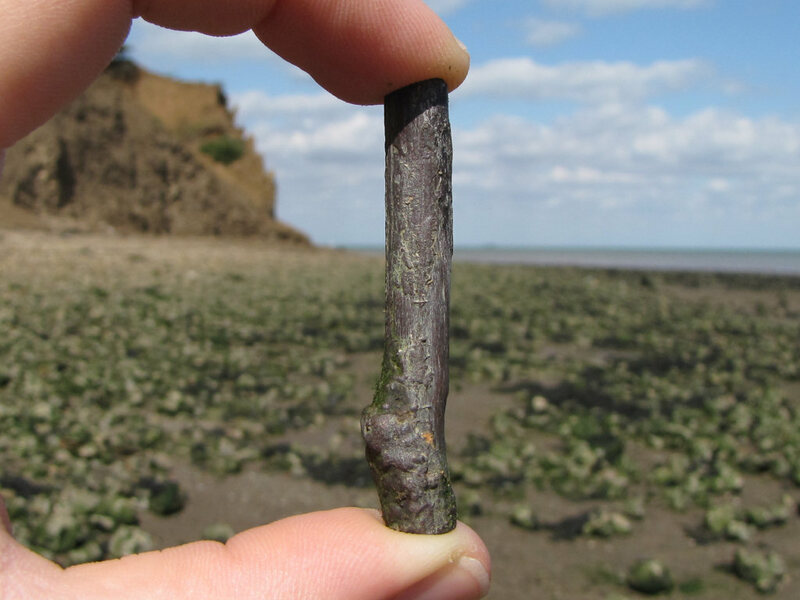 The prehistoric evidence reveals Kent (including the Isle of Sheppey) lay beneath a warm, shallow sea (<100m), the nearest significant landmass was perhaps 30+ miles away for much of this time. As a result conditions on the seafloor were relatively undisturbed, allowing fine particles of sediment suspended in the water column to gradually settle; however, short-term fluctuations in tidal currents and sea level introduced sand to the area throughout this time, particularly towards the end. 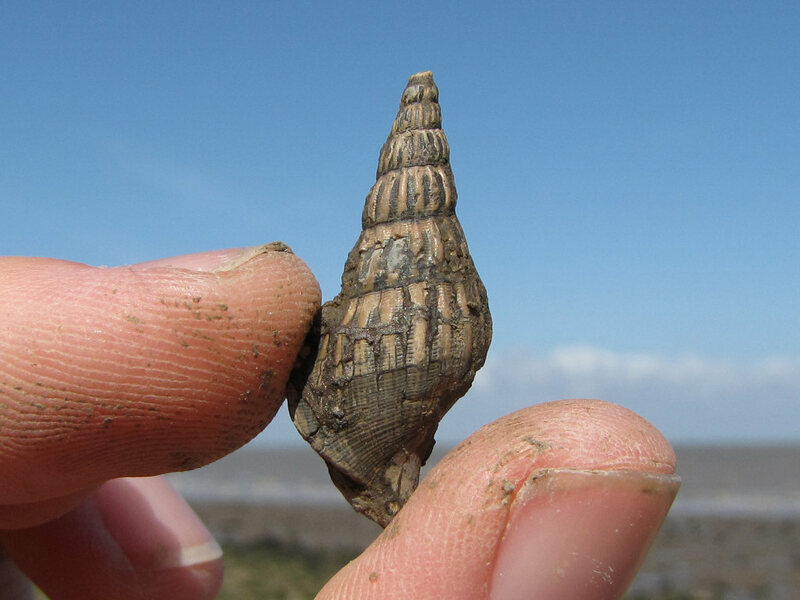 Life during the Eocene was abundant, the relatively near landmass was covered by lush tropical vegetation and fringed by a swamp-like environment, providing habitat for mammals, birds and insects, whilst at sea marine life flourished. 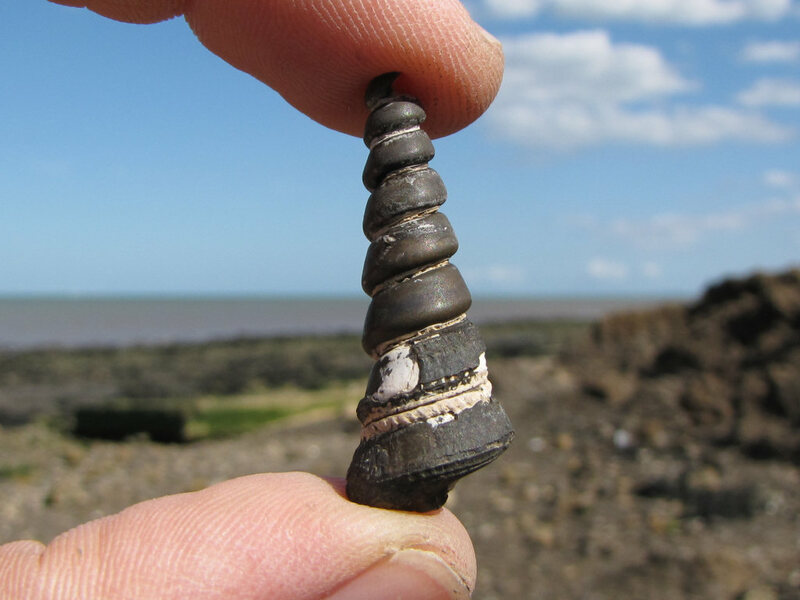 The diversity of life is represented in the fossils found at Warden Point which includes both marine and terrestrially sourced organisms, the latter consisting largely of pyritised twigs, fruits and seeds, and in rare instances insects that were transported by tidal currents. 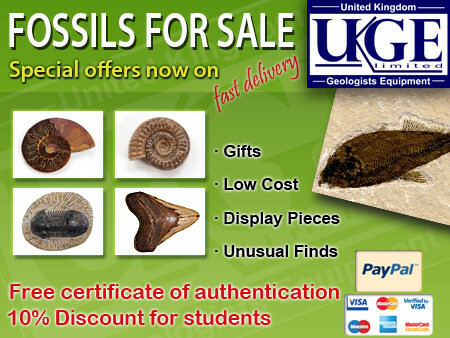 In very rare cases the fossilised remains of birds and mammals have also been discovered. 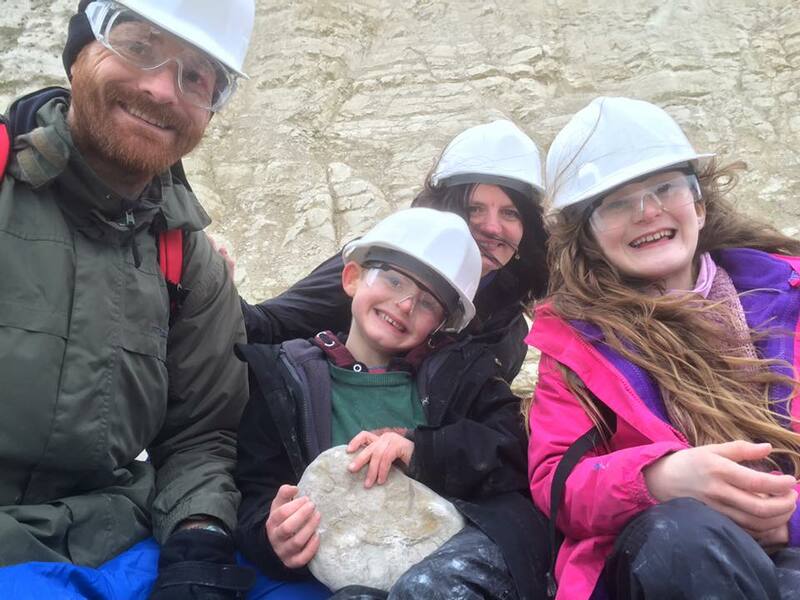 Today the London clay exposed on the foreshore and in the cliff is subjected to intensive scouring by the sea, replenishing the fossil material on the beach throughout the year. 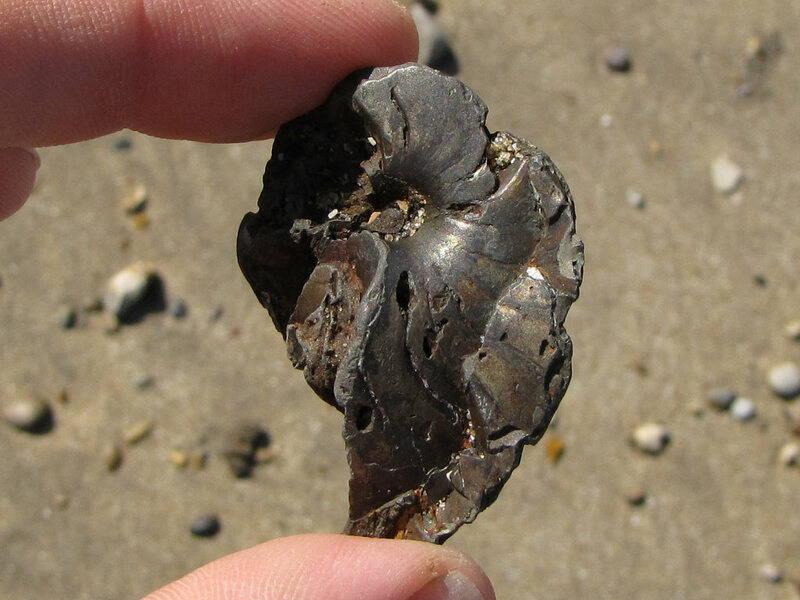 Fossils can be found all year round along the entire stretch of coast around Warden Point. 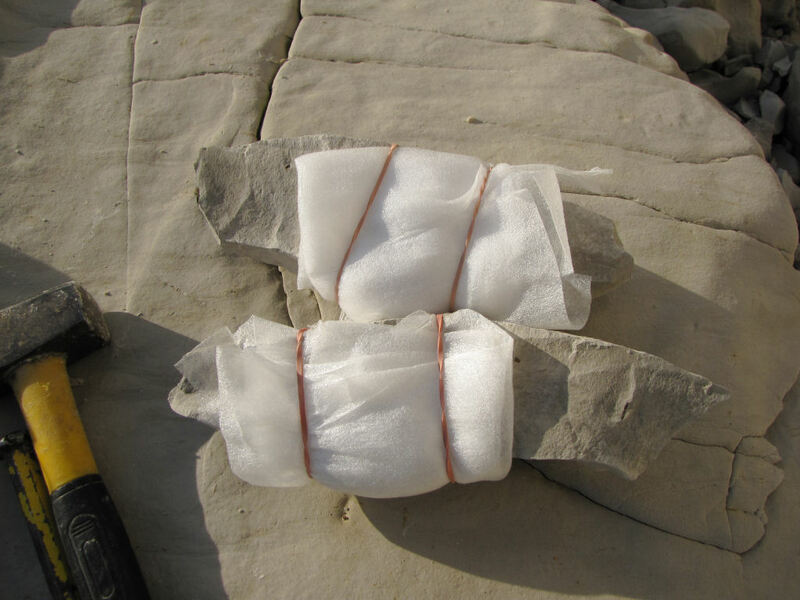 The eroding cliffs provide the opportunity to find in situ specimens, however it’s generally more productive to spend time exploring the foreshore and the wave-washed tip of collapsed cliff sections. 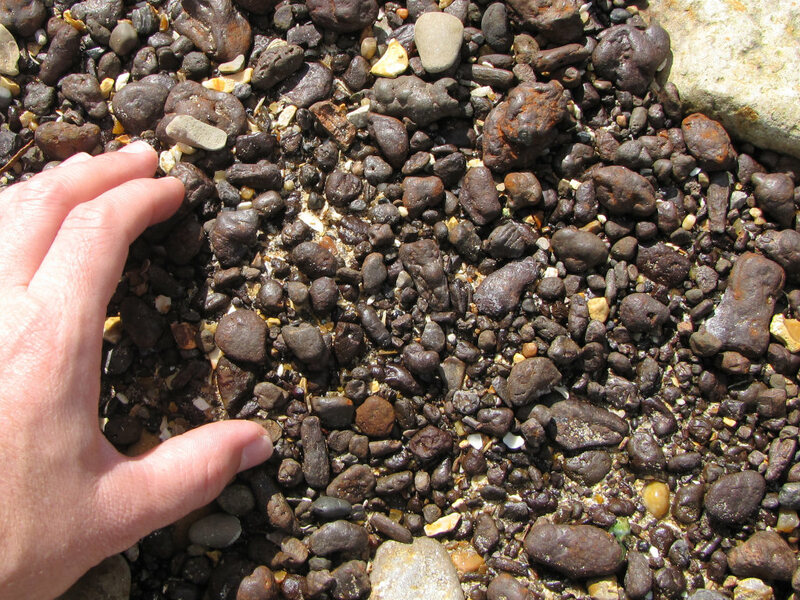 The soft London Clay is eroded by the sea, isolating the more erosion-resistant pyrite and phosphatic nodules and depositing them on the beach. 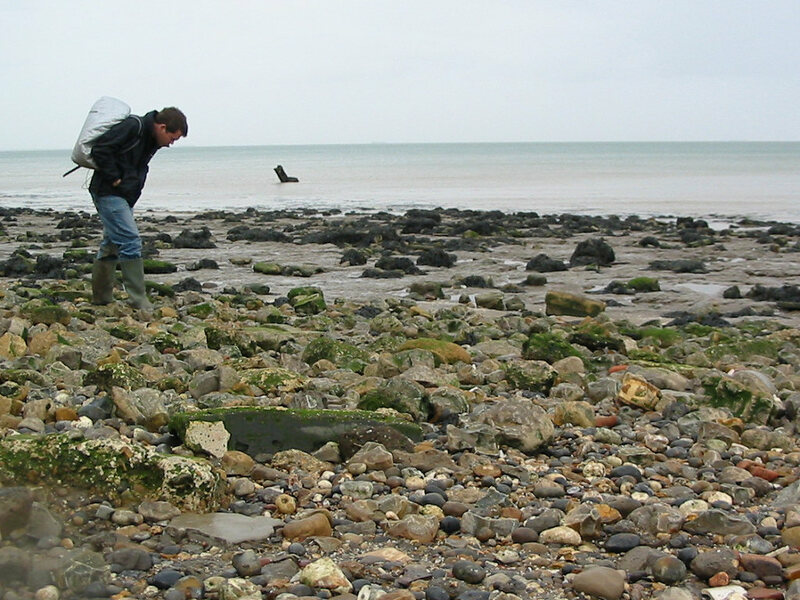 Above: Searching for loose fossils among the pebbles on the foreshore. Above: A Zanthopsis crab carapace preserved as a loose phosphatic nodule. It’s worth spending some time searching through the accumulations of pyrite debris, as a high proportion preserve the evidence of wood, fruits and gastropods in particular; a few moments in one spot usually yields several finds. Unfortunately however, pyrite is highly reactive to the fluctuating humidity present in a typical family home, and consequently it’s worth bearing in mind that these fossils, especially wood and fruits, will begin to decay within a matter of weeks. 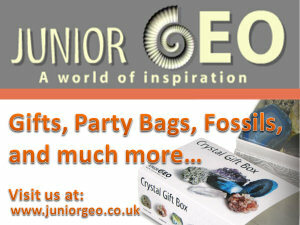 To read more about pyrite click here. Above: A concentration of pyrite debris, containing a high volume of fossil plant material. 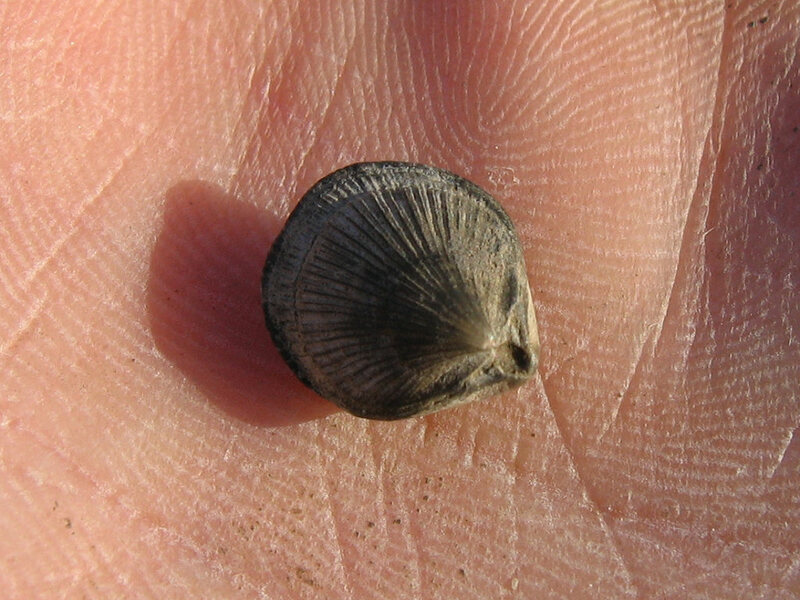 Above: A Nipa palm fruit, found among a concentration of pyrite pebbles. 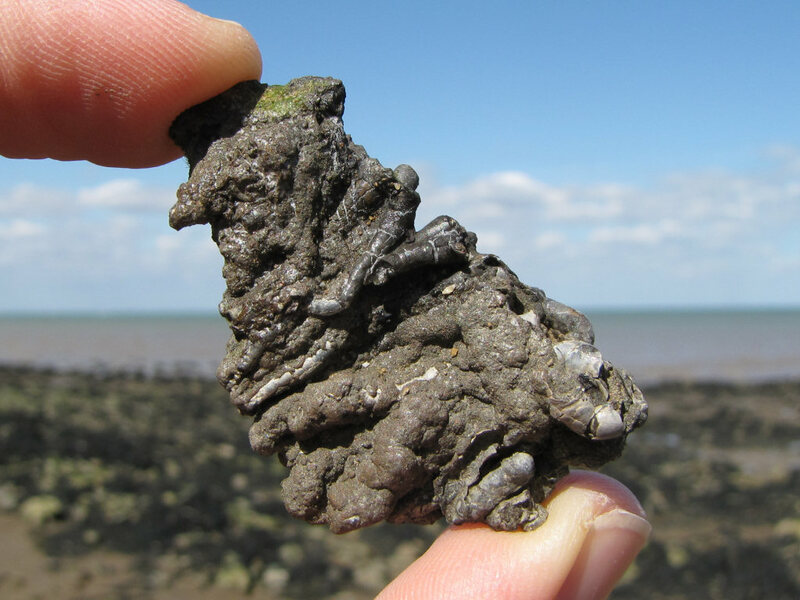 At low-tide a large expanse of London Clay is exposed on the foreshore, providing the best opportunity to discover in situ specimens. Among the objects of most interest are pale-cream coloured phosphatic nodules that protrude above the eroding clay. 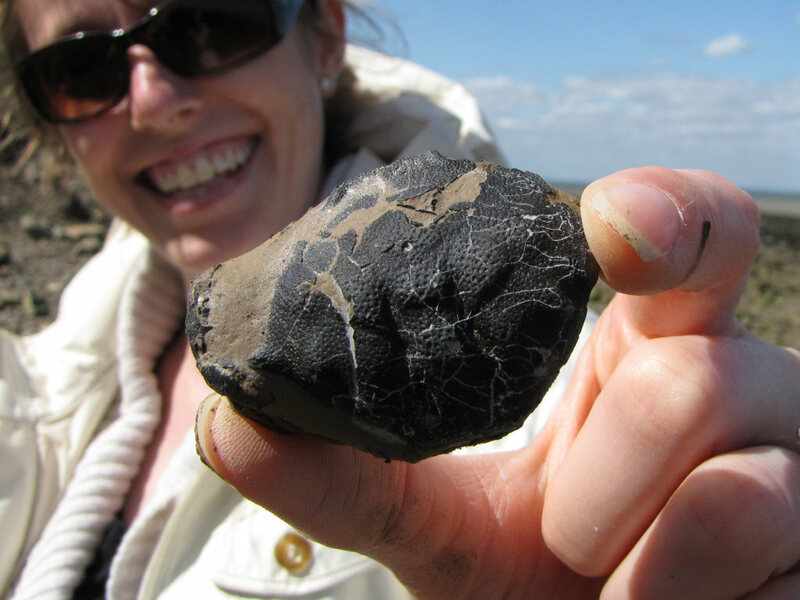 Fossil material is present in many of these nodules and in a small proportion complete organisms are preserved, in particular crabs and lobsters. 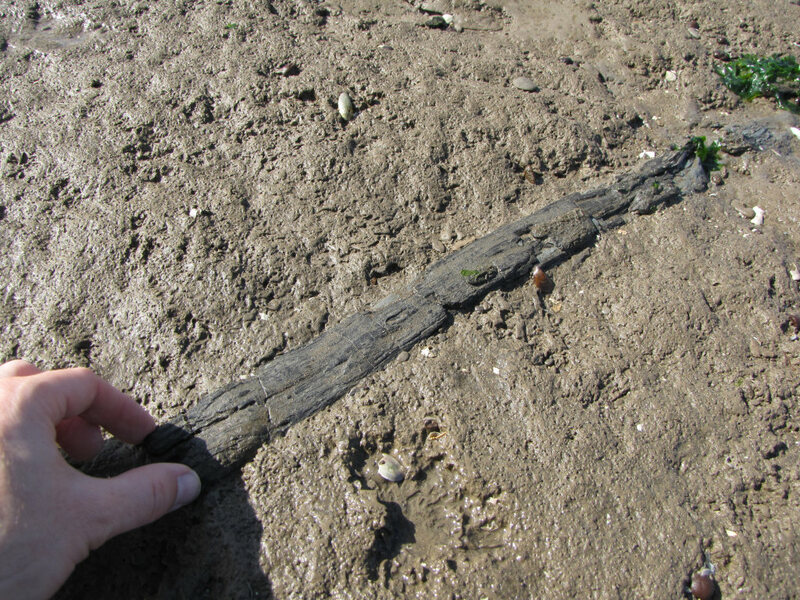 Above: At low-tide the in situ London Clay can be explored on the foreshore. 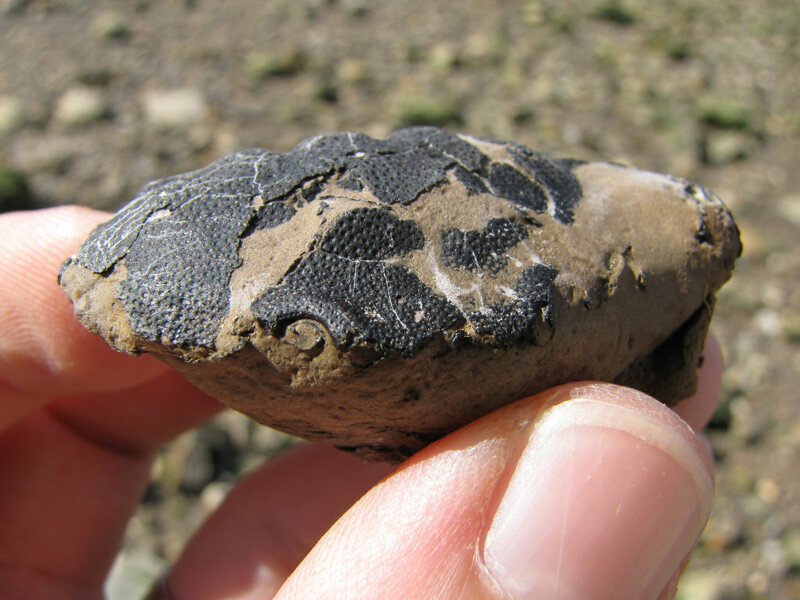 Above: Fossil bearing phosphatic nodules can be found protruding from the clay. 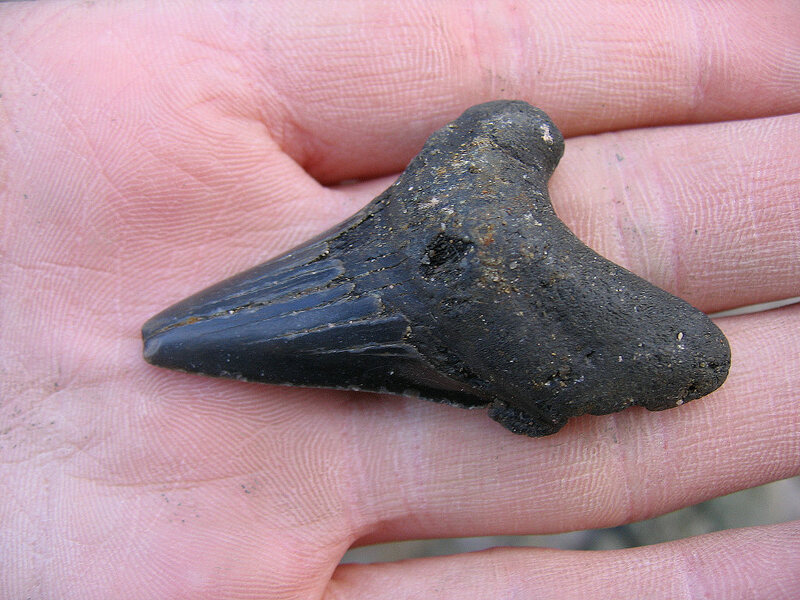 Below are a selection of finds made over several visits to Warden Point. 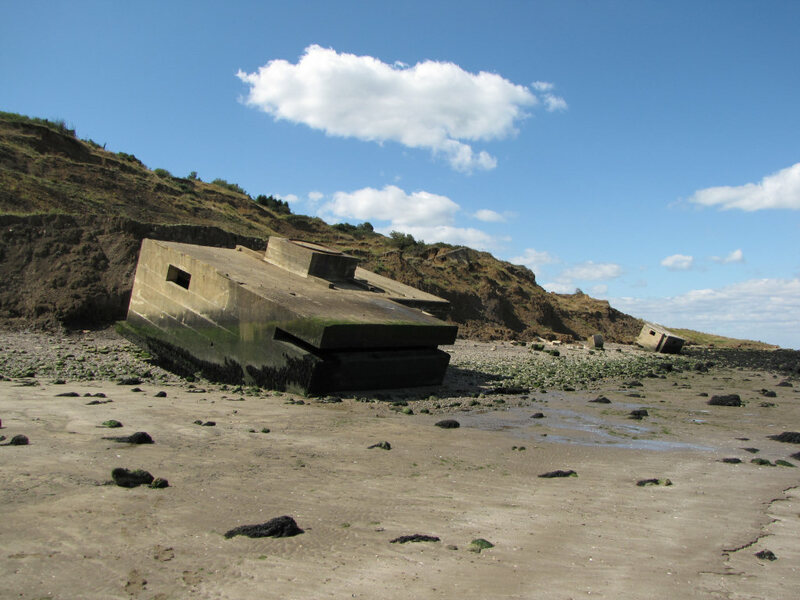 The best time to visit is during the winter and spring or following stormy weather, when the beach has been churned over and new material exposed. 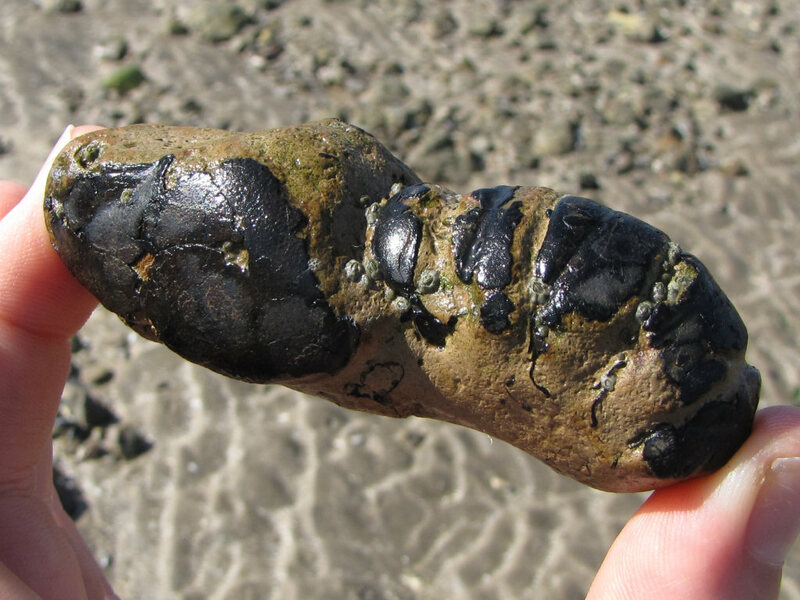 It’s usually possible to recover one or more phosphatic nodules containing partial or sometimes near-complete crustaceans; however, for much of the year Warden can prove a challenge and good specimens are hard to come by. 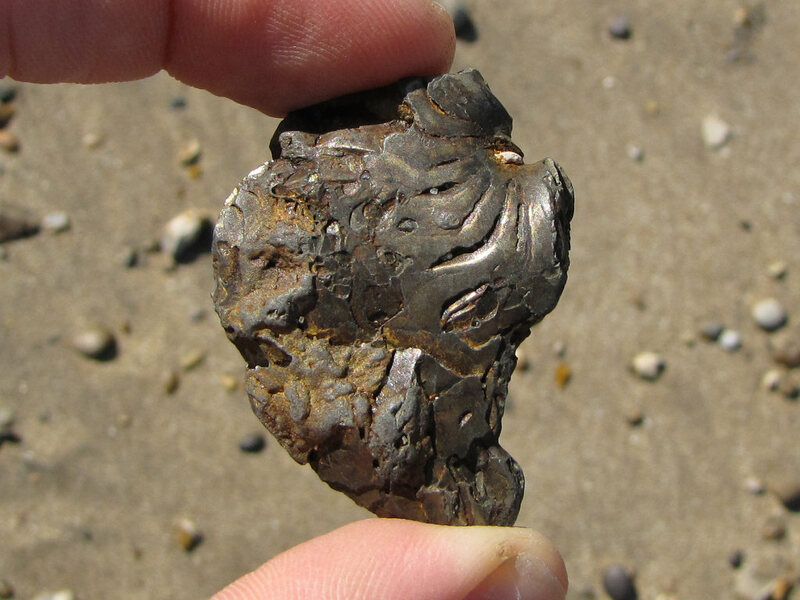 Among the most common finds include: pyritised wood and fruits, the internal pyrite moulds of bivalves and gastropods, and phosphatic lobster burrows. Above: The carapace and abdomen on a Hoploparia lobster, preserved as a phosphatic nodule. 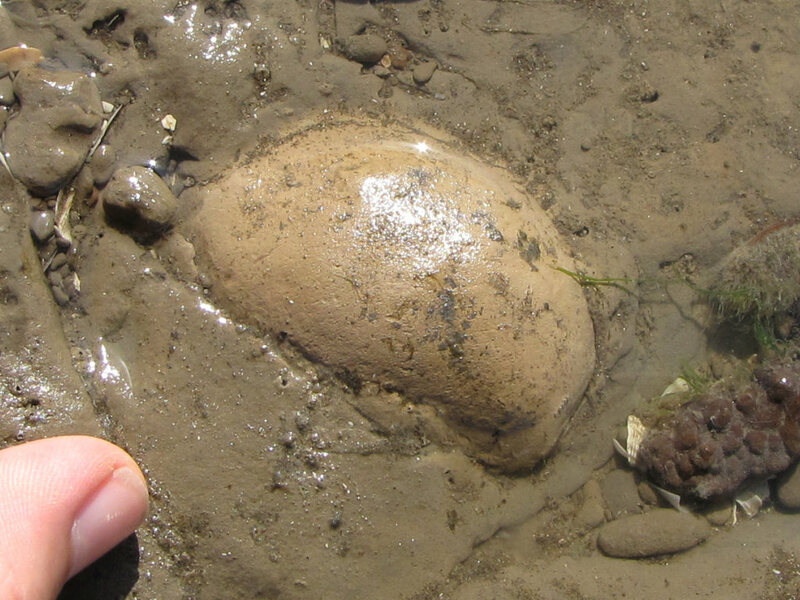 Above: A lobster burrow preserved as a phosphatic nodule, shown alongside a Hoploparia lobster for illustrative purposes. Above: A partial lobster burrow. 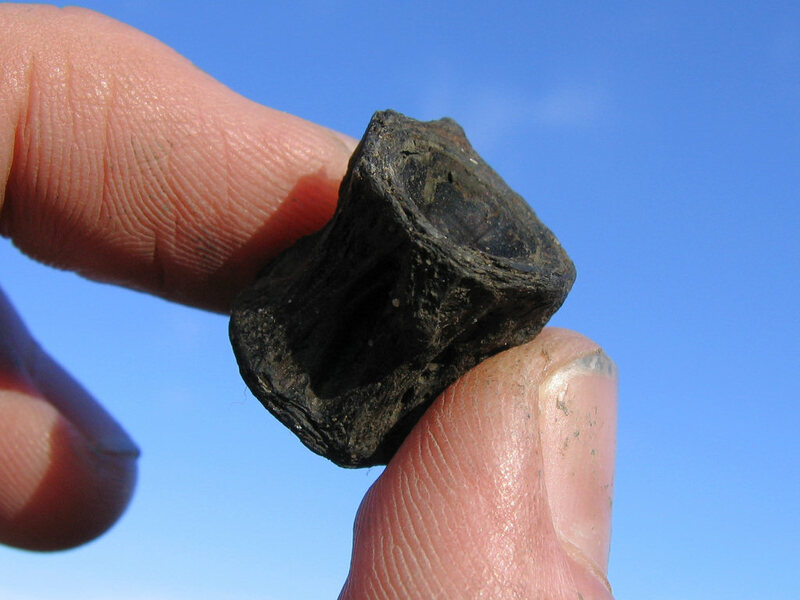 Above: An isolated fish vertebra found within slumped clay at the cliff base. 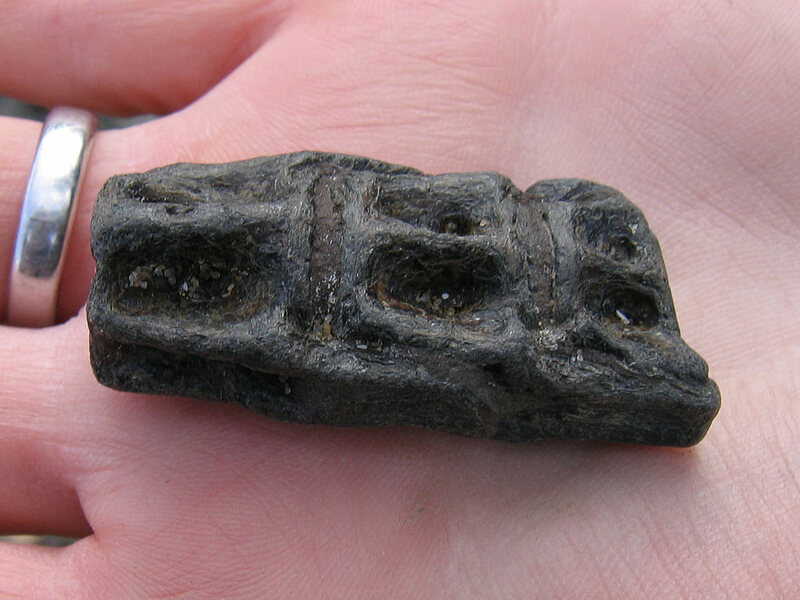 Above: Three fish vertebra fused together, found loose on the foreshore. 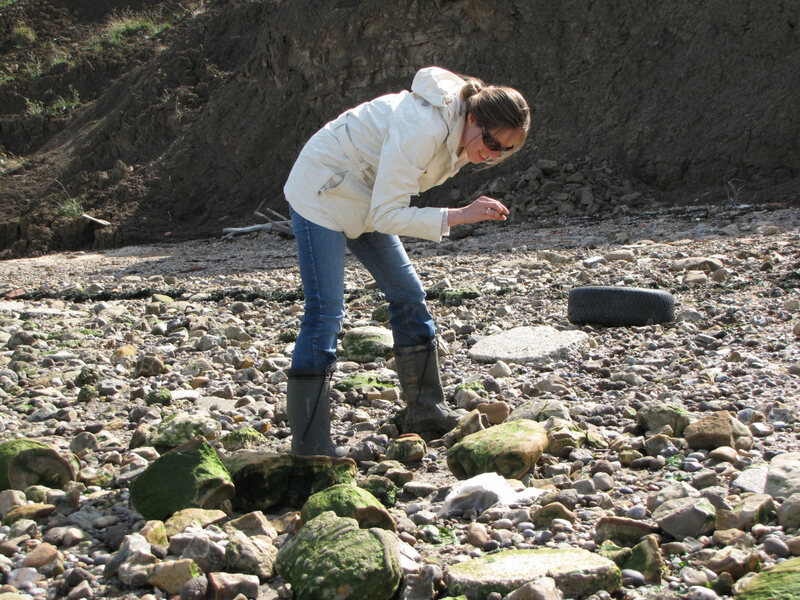 Above: Lucinda finds a beach-worn Striatolamia(?) shark tooth among the pebbles. Above: A selection of shark and ray teeth, fish vertebra and a lobster tail, found loose on the foreshore. 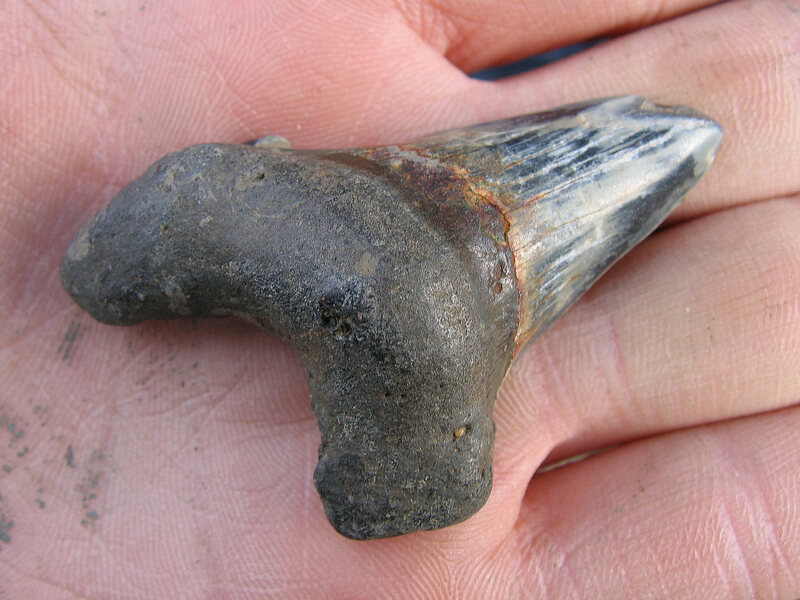 Above: A large Otodus shark tooth, found loose on the foreshore. 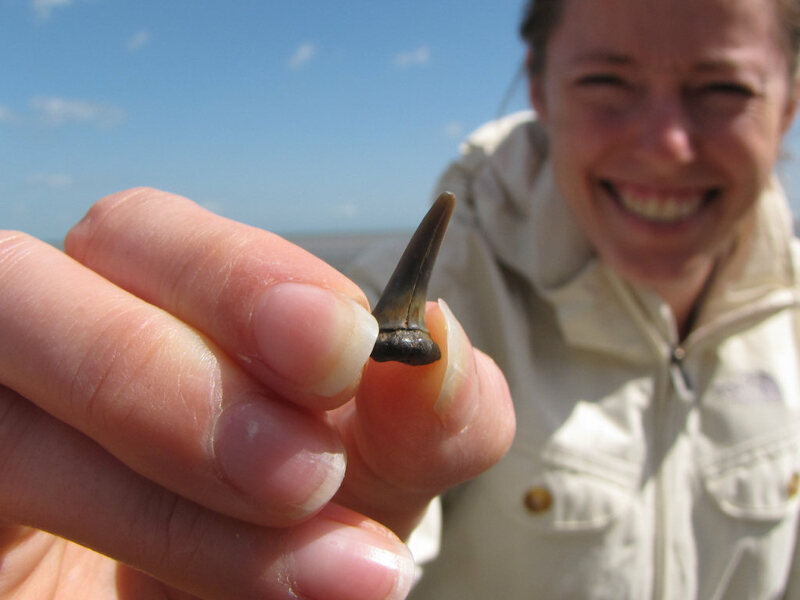 Above: A second Otodus shark tooth, found loose on the foreshore. 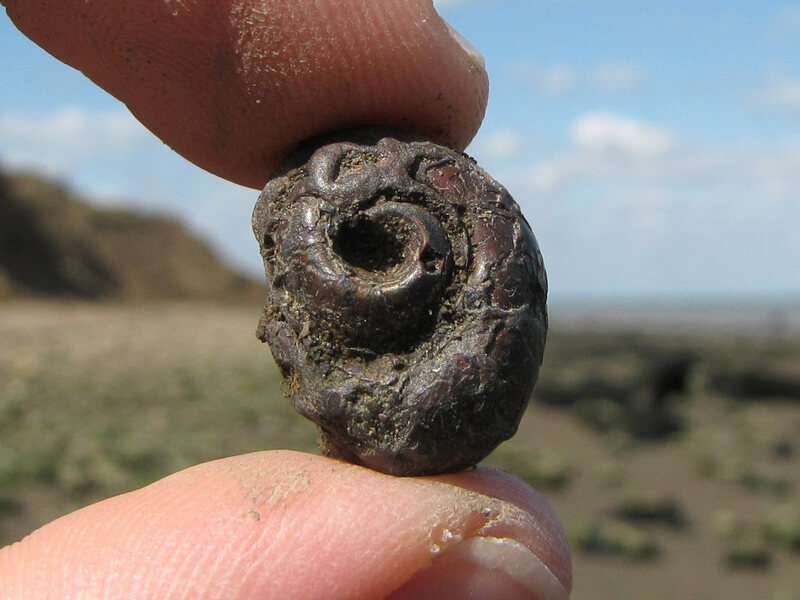 Above: A heavily worn partial nautiloid, found loose on the foreshore. Above: The same specimen as featured previously above, viewed from the reverse-side. Above: The internal pyrite mould of a Orthochetus gastropod, found loose on the foreshore. 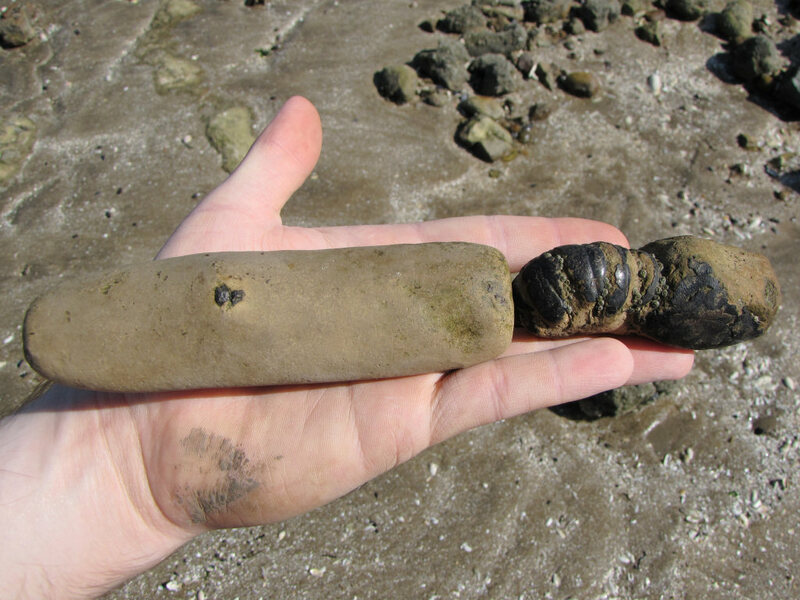 Above: A Eotibia gastropod, found embedded within the slumped clay. Above: A small Tectonatica(?) gastropod, found among loose pyrite debris. Above: A heavily worn internal pyrite mould of a Limacina(?) gastropod. 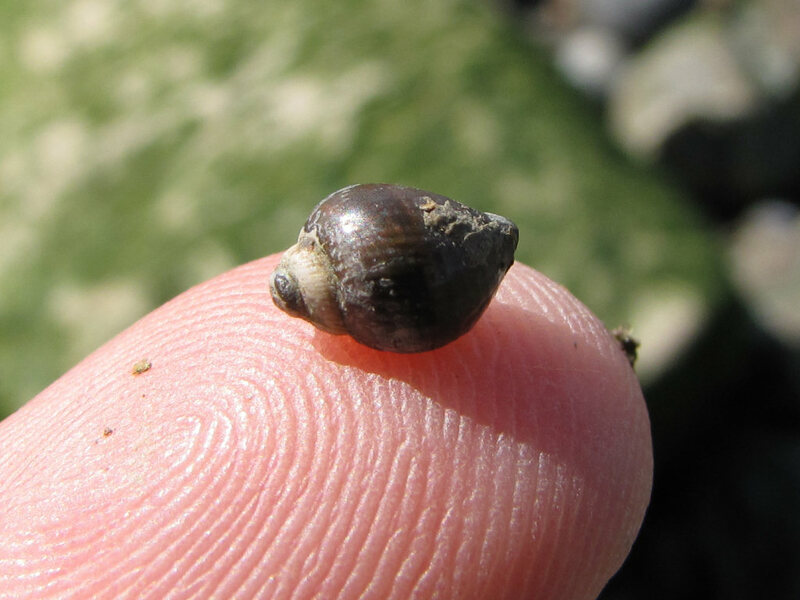 Above: A small (7mm) Terebratulina brachiopod, found loose on the foreshore. Above: The pyritised tubes of the wood boring Teredo bivalve. 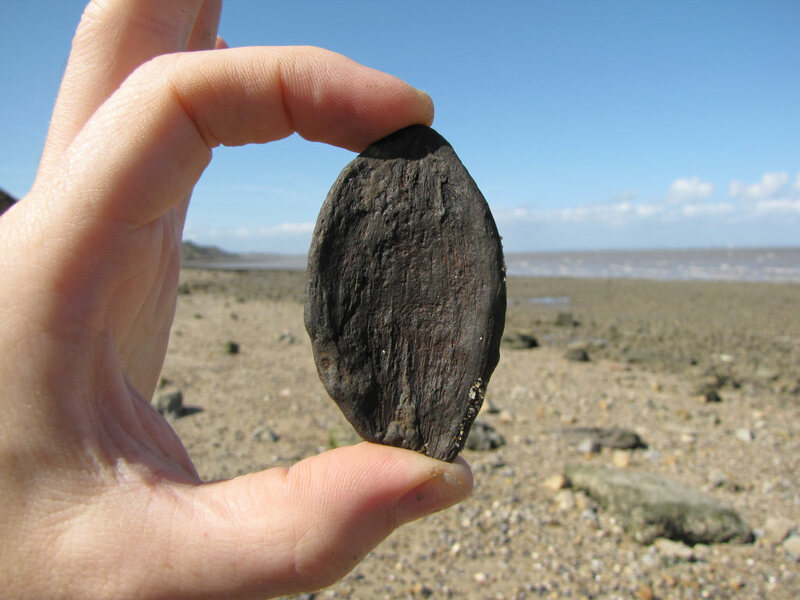 Above: A fragment of pyritised drift wood, found loose on the foreshore. 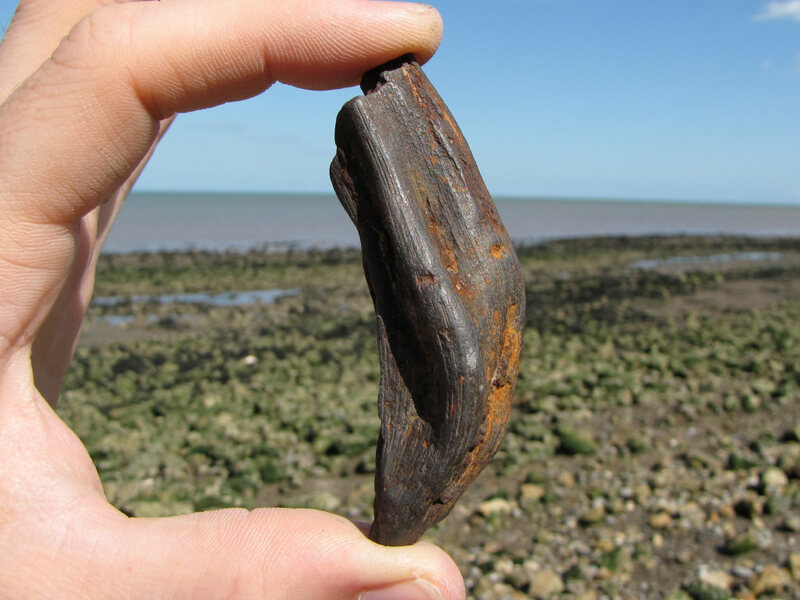 Above: A fossilised tree branch of drift wood in situ on the foreshore. 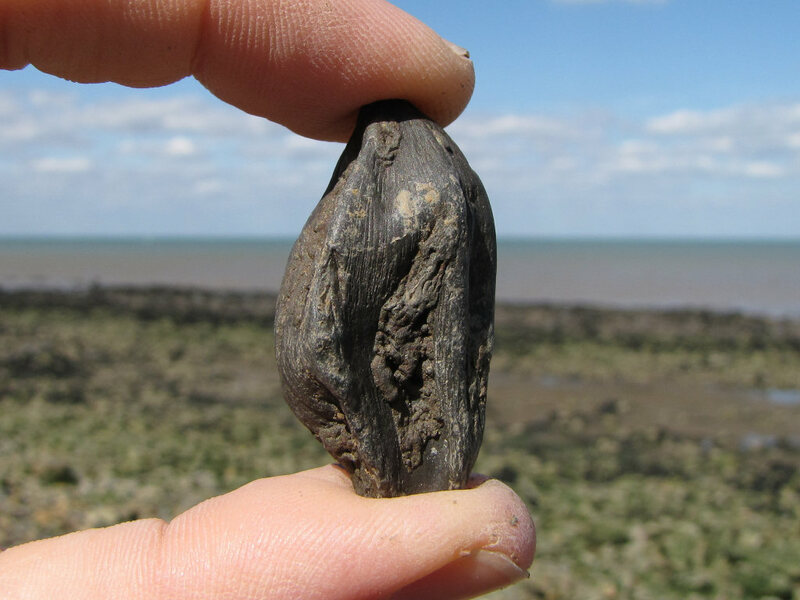 Above: A Nipa fruit, found loose among a concentration of pyrite debris on the foreshore. 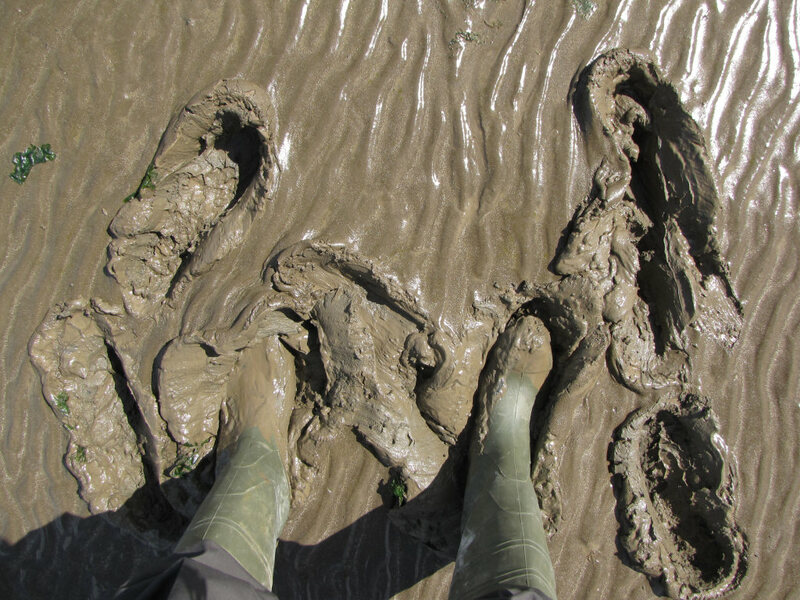 Above: Wellies are recommended as the foreshore varies from pebbles to deep mud. 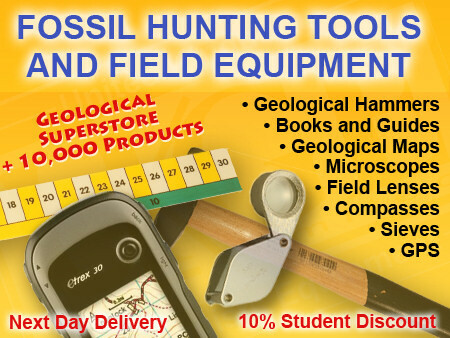 It’s a good idea to spend some time considering the tools and equipment you’re likely to require while fossil hunting at Warden Point. Preparation in advance will help ensure your visit is productive and safe. Below are some of the items you should consider carrying with you. 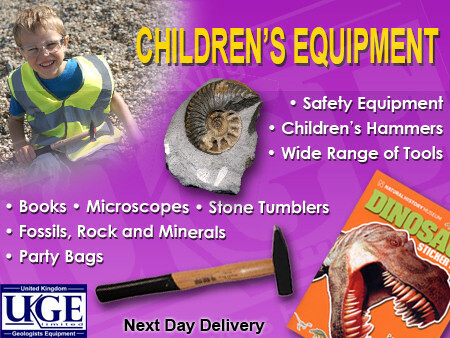 You can purchase a selection of geological tools and equipment online from UKGE. Walking boots (or wellies): A good pair of walking boots or wellies will help protect you from ankle sprains, provide more grip on slippery surfaces and keep you dry in wet conditions. 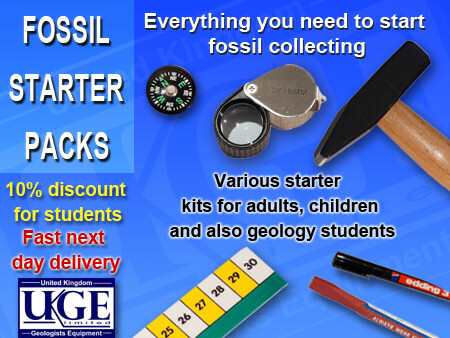 During your fossil hunt you’re likely to encounter a variety of terrains so footwear needs to be designed for a range of conditions. Page references: Atlas of Palaeogeography and Lithofacies, Geological Society Memoir No. 13, J. C. W. Cope, J. K. Ingham and P. F. Rawson; Geological Conservation Review Series; British Tertiary Stratigraphy, B.Daley and P.Balson; London Clay Fossils of Kent and Essex, D.Rayner, T.Mitchell, M.Rayner, F.Clouter; www.sheppeyfossils.com, F.Clouter; average annual temperatures across Southeast England, www.metoffice.gov.uk. Many thanks to Fred Clouter for confirming the identification of several of the specimens featured.